Warning: Spoilers for the first three Chronicles of Prydain below! We seem to have come a fair distance from the epic fantasy of The Book of Three and The Black Cauldron over the last two books - The Castle of Llyr was more humour based, while this moves away from looking at the fate of the world to focus firmly on Taran's character. 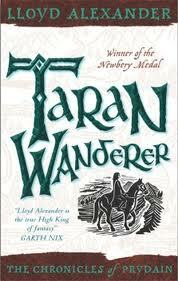 That's not a criticism, however - Taran has become such a wonderful hero that it's great to see a book in which he really comes of age properly. Even though he's fought valiantly before and proven himself in the eyes of all around him, it's the lessons he learns in this volume which really show that he's a man by the end. Of course, it wouldn't be a Prydain novel without a wonderful supporting cast, and we see the return of Fflewddur Fflam, Gurgi, and King Smout, amongst others, as well as a host of interesting new characters. I would say the pace was significantly slower than any of the other three books so far, but this didn't put me off at all - apart from perhaps The Black Cauldron, I think this is my favourite of the first four. High recommendation to readers, but you'll obviously want to check out the first three books before reading it!